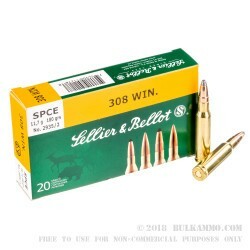 One of the few companies to still offer the “Cutting Edge” projectile, Sellier & Bellot has chosen to put it atop a high end .308 cartridge build. The purpose of which is to deliver consistent, stopping power to big game hunters who wish to use tried and true methodologies rather than accept blindly, the marketing hype that many manufacturers are advertising come deer season. The old school design might be compared to the concept of a mechanical watch, where the watch works by actual mechanical function instead of the engineered quartz movement. 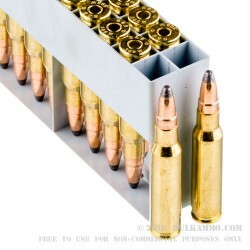 The bullet works by mechanically forcing a component part into another component part to achieve accurate uniformity and expansion upon impact so that the bone and flesh it penetrates can contribute to the stopping power delivered. That is in contrast to a newer designed projectile which might use a slit in the tip to try to force a petal to peel back to improve expansion uniformity and diameter. What’s the point? Well, it’s more than just a novelty. 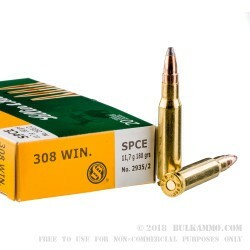 The S&B SPCE is a proven hunting round that can help ensure some level of stopping power is delivered through the wound channel travel as the projectile strikes bone, flesh and organs. 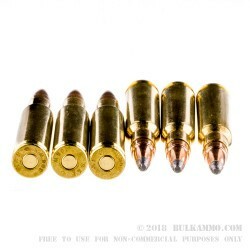 A different approach to a proven deer round that seems to have a cult following of users.